In What Keeps Me Sane, the 2013 winner of the Naomi Long Madgett Poetry Award, Esperanza Cintrón introduces four women whose lives never cross. Yet each in her own way is challenged by conditions that lead her to the brink of insanity. Ayio is a popular and successful author, but there are dry periods when the words refuse to come. The last and longest dry period causes her mother to seek psychiatric help for her and finally a facility for the mentally ill.
Lily, the eldest of eighteen children, sacrifices her dreams for the need to care for her siblings. She seeks escape from her duties by taking on the identity of characters in books and movies, but as years go by, she struggles to keep her sanity, realizing that she will never have a life of her own. Brisa hides her emotional needs in her deep involvement in the events taking place in Puerto Rico, wearing "the mantle of revolution/ like a nun's habit." When she finds joy in her relationship with a man, she feels the guilt of a person who feels she does not deserve happiness amid such suffering. Therapy brings no relief. Plum is raped and impregnated by her mother's boyfriend who knows that "she won't believe you." When the man leaves, her mother blames her and insists that she keep the child, but Plum permits a social worker to take it away and place her in a facility for her own safe keeping. While all four of these women are challenged mental breakdowns, each one eventually achieves a suggestion of triumph and a promise for a better future. Esperanza Cintrón was born in Detroit, Michigan when it was a prime producer of music and automobiles and was the fifth largest city in the country with a population that exceeded 1.5 million. Her first book of poetry, Chocolate City Latina, published by Swank Press in 2005, is flavored with a bit of her African American and Boricua spice while exploring that late twentieth century metropolis "When Cadillacs Roamed the Midwest." The city's history and its people, especially the women who lived through the highs and lows of the Midwestern city-town, permeate her work. Cintrón studied film and communication earning both bachelor's and master 's degrees from Wayne State University and a doctorate in English literature from The State University of New York at Albany. There she co-founded The Sisters of Color Writers Collective and its literary journal Seeds (1989-2006), both of which were dedicated to publishing the works of women. 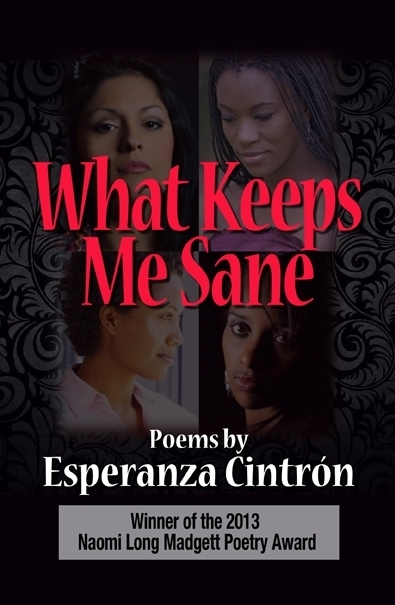 Her poetry and short fiction has been published in a number of anthologies including Double Stitch: Black Women Write About Mothers & Daughters (Beacon Press), Erotique Noire/Black Erotica (Doubleday), Abandon Automobile (Wayne State University Press) and the journals Capirotada, 13th Moon, and The Little Magazine. She received a Michigan Council for the Arts Individual Artist grant and the Metro Times Poetry Prize, and she was a 2012 Callaloo Creative Writing Fellow. Cintrón currently lives, writes and teaches college in downtown Detroit.